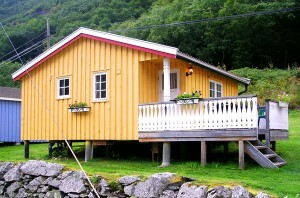 Cabins with 2 rooms, 5 and 6 beds without shower and toilet. These have two rooms each; one sitting room /kitchen equipped with lounge furniture, a TV, counters/cupboards, a fridge and two hot-plates. A sofa can be used for overnight accommodation for two persons. One of these cabins have four bunk beds in the bed room, in the other two cabins the bedrooms are equipped with a double bed and a top bunk. There are two closets in each bed room. All beds have thick mattresses. The cabins come equipped with quilts and pillows. 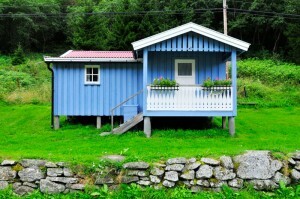 If you need sheets, pillow-cases and quilt covers, these can be rented for 45,- NOK. Towels can be rented for 25,- NOK. The kitchen is equipped with everything you need for your own housekeeping. Shower and toilet is in the modern sanitary facilities. 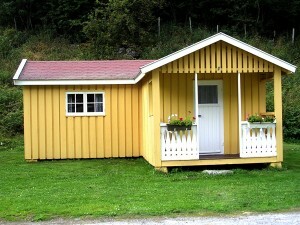 Cabin with 4 beds and one room without shower and toilet. This cabin has one room. The kitchen is equipped with everything you need for your own housekeeping. It is equipped with a TV, a fridge, counters/cupbords, two hotplates and four bunk beds with thick mattresses. There are pillows and blankets in the cabin. 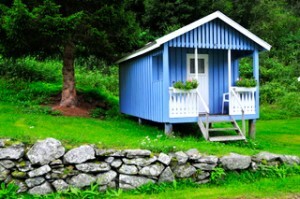 This cabin has one room, with lounge furniture, a sofa can be used as a overnight accommadation for two, and two bunk beds with thick mattresses. There is a TV and shower/toilet with hot and cold water. The beds come with quilts and pillows. If you need sheets, pillow cases and quilt covers, these can be rented for 45,- NOK. Towels can be rented for 25,- NOK. The kitchen is equipped with everything you need for your own housekeeping, including hot and cold water, a fridge and a double hot-plate. This cabin has a kitchen/sitting room equipped with lounge furniture, a sofa can be used as a overnight accommodation for two. TV. The kitchen is equipped with everything you need for your own housekeeping, including hot and cold running water, a fridge and a double hot-plate. The bedroom is equipped with a double bed and a top bunk. There are two closets. 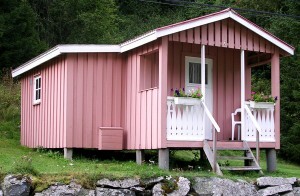 These cabins are equipped with quilts and pillows. If you need sheets, pillow cases and quilt covers, these can be rented for 45,- NOK. Towels can be rented for 25,- NOK. There is a shower/toilet with hot and cold running water. These have a kitchen/sitting room equipped with lounge furniture , a sofa, can be used as a overnight accommodation for two, and a TV. The kitchen is equipped with everything you need for your own houskeeping, including hot and cold water, a fridge, and a double hot-plate. Two bedrooms each with a double bed. One bedrom has a top bunk. Closets. These cabins come equipped with quilts and pillows. If you need sheets, pillow cases and quilt covers, these can be rented for 45,- NOK. Towels can be rented for 25,- NOK. There is a shower/toilet with hot and cold running water.